Tuesday we were in the water in Hallock Bay, a shallow body of water with a narrow inlet into Orient Harbor. This bay is the site of my grass mat deployments, but it is also the site of a free plant spawner sanctuary. 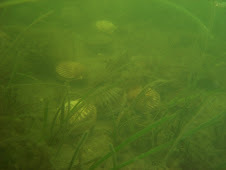 Free plant means that scallops are just released to the bottom - no nets or cages here. Last November we planted about 70,000 seed scallops to the bottom in a bouyed off area, and dove on the site on Tuesday to look at overwinter mortality. The first site we looked at was almost heartbreaking - while we were still getting around 5 live scallops per square meter, we had extremely high mortality. We think this is partly attributed to the 100% macroalgae cover and the anoxic layer underneath the algae that results from such a dense assemblage. Many of the scallops were "trapped" in this layer, probably due to the late planting date, with the water too cold for the scallops to be very active and try to move up onto the canopy. However, not far away, where the cover was not as dense and had more Codium, we were finding upwards of 20 per square meter still surviving, which was very good to see. In other portions of this bay we didn't find too many seed scallops, although we found a few large, possibly year 2 adults. Hopefully we see better numbers in Hallock Bay this year with the decent overwinter survival of the free planted scallops. Wednesday we dove mostly in Orient Harbor, first near the long lines where we have probably near 500,000 scallops hanging in lantern nets. We had decent seed recruitment there in the fall, and at various places within Orient, so we wanted to look at overwinter mortality. 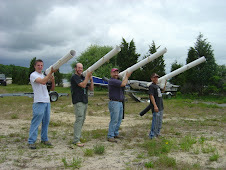 Some places we dove had fewer scallops than in the fall, and some places had far more scallops. All in all, we are seeing some decent returns from last fall. We have about 14 more sites to visit next week, so we will see whats going on then, but right now, things look like they are going to be ok.
On a lighter note, there was alot more activity going on in the bays then I expected. Spider crabs were out in the dozens, and it appeared to me as if many of them were mating, although I am not 100% about the mating rituals of spider crabs. Lots of whelks moving around the bottom too, as well as some drills. 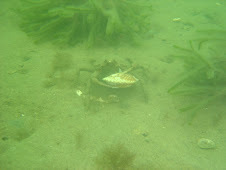 I also saw a very large (at least it looked large underwater) winter flounder, which was very docile. I was petting it and it barely moved. It finally swam away when I grabbed its tail. If only I had one of the larger dive bags I am confident I would have had dinner! I also saw a couple of skates, although which species I am not sure. They don't like to be touched at all, and when I tried to rub their backs they darted off. Anyway, some pretty exciting stuff, diving with my new drysuit, seeing some scallops, and seeing pretty interesting things as well. I can't wait until next week.